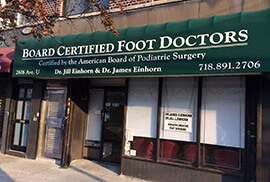 Podiatrists Jill Einhorn, DPM and James Einhorn, DPM, with offices located in Brooklyn, NY and Astoria, NY, are dedicated to providing the best in foot and ankle services for patients. 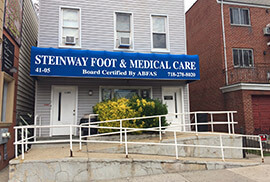 Our podiatrists treat a wide range of podiatric conditions, including heel pain and toenail fungus, and offer services such as custom-made orthotics, diabetic foot care, wound care, and sports medicine. We accept most insurance plans and welcome new patients! If you have any questions or would like to schedule an appointment, call one of our offices today!